Successfully Added 7 Inch FPV Monitor - 1024x600 IPS Screen, 16:9 Aspect Ratio, 600cd/m2 Brightness, 800:1 Contrast Ratio, 32 Channels to your Shopping Cart. 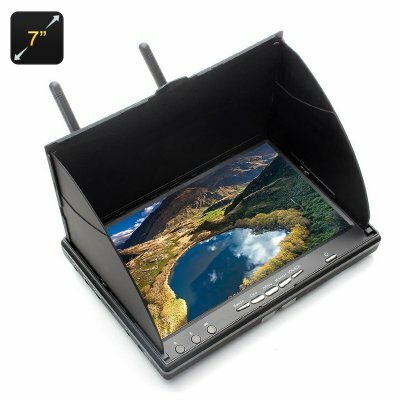 The 7 inch FPV monitor comes with the 1024x600 resolution, 16:9 aspect ratio and is perfect for outdoor aerial photography. Whether you are an experienced drone guru or just looking into aerial photography, this 7 inch FPV monitor is a great accessory for making your hobby increasingly convenient and fun. The monitor is designed specifically for outdoor use and is easily portable. Despite its ultra-thin design, it comes with a 2200mAh battery – which gives you up to 2 hours of continuous usage time. The 7 inch monitor supports 32 channels and comes with the auto-search function. All you need to do is long press the Search icon and the monitor will look for channels automatically. With the 600cd/m2 brightness, the FPV screen will give you quality viewing and a clear screen even if the lighting is not at its best. If you think the outside lighting is actually way to bright for your liking, the FPV monitor conveniently comes with a collapsible sunshade, letting you avoid glare even in the sunniest of days. Now you can get the FPV from your sports action camera and see the feed from your drone mounted camera or view spectacular shots from a safe distance away of extreme sports and daredevil antics. The monitor is compact and easy to navigate. It comes with simple controls and function buttons, including Auto Scan and Channel Switch. The 7 Inch FPV Monitor comes with 12 months warranty. Brought to you by the leader in electronic devices as well as wholesale FPV monitors, Chinavasion..